The Batman v Superman panel at San Diego Comic-Con, as well as the subsequent trailers, cleared up a lot of the mystery surrounding DC’s big-screen hero clash. But one of the few remaining questions that has plagued fans surrounds the identity of Lex Luthor’s spectacled associate. We all had our guesses, but Warner Bros. and DC have officially acknowledged the character, and she’s someone fans of the canon will recognize. We see her walking the halls of Lexcorp, we see her leading the cold corpse of General Zod (Michael Shannon), and now we have a name: Mercy Graves. The latest installment of DC All Access was a trailer breakdown of the Batman v Superman Comic-Con trailer. Setting aside for a moment the fact that DC is now following in the footsteps of the movie blogosphere, the video included around the 2:20 mark the identity of actress Tao Okamoto. It's a character that has been rumored for quite some time, but this is the first official confirmation we have. 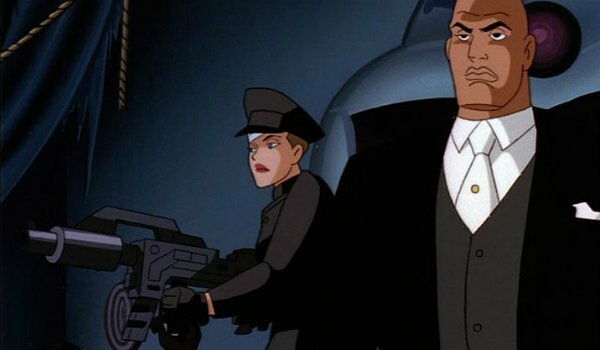 Graves is typically depicted as Luthor’s personal assistant and chauffeur, though her street-fighting skills make her a perfect bodyguard. The character made her debut in Superman: The Animated Series before making her crossover into the comics. She’s also appeared in other animated series, including Young Justice, where she’s actually a robot-human hybrid with a bionic arm that doubles as a canon. In short, Kal-El and Bruce Wayne should not underestimate her when she makes her live-action debut in Batman v Superman. Watch the DC All Access trailer breakdown below to get more information on Graves and other hidden gems from the film. Elsewhere, Empire magazine released three new images of Batman v Superman from the pages of the latest issue. While our title heroes are looking mighty fine, we also get a new look at Graves's employer looking the most Mark Zuckerberg-ian than ever before. Note the Urban Outfitters-esque tee he's wearing of a monkey holding a grenade -- oh, and that hair, of course. Joining Henry Cavill, Ben Affleck and Jesse Eisenberg on this new adventure are Gal Gadot as Diana Prince/Wonder Woman, Laurence Fishburne as Perry White, Amy Adams as Lois Lane, Diane Lane as mama Kent, Jeremy Irons as Alfred, Holly Hunter as an anti-Superman Senator, and appearances from Jason Momoa as Aquaman, Ezra Miller as The Flash, and (reportedly) Ray Fisher as Cyborg. Superman may have saved Earth from Zod and his World Engine, but the ensuing battle devestated civilization and many see him as a false god. Incited by Luthor, who has villainous plans of his own, Batman rises up to throw down with the Man of Steel.